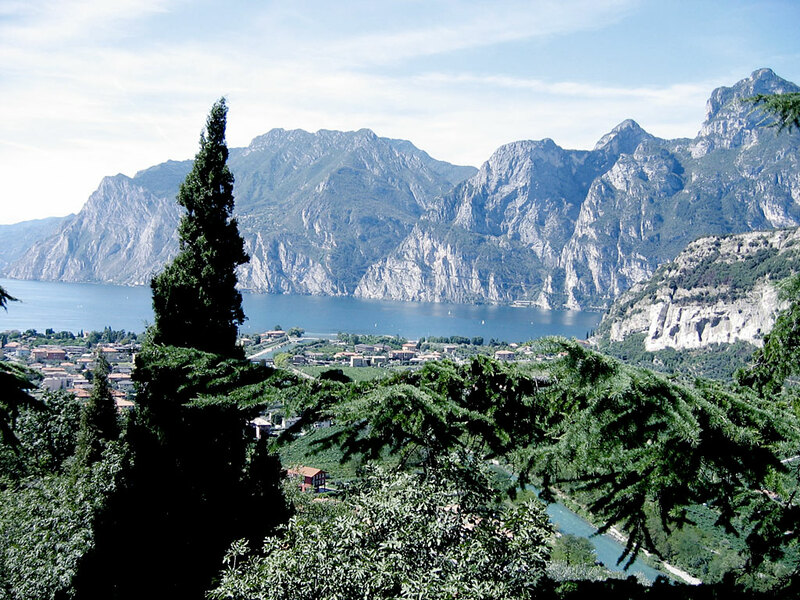 Here we illustrate some of the boat itineraries on Lake Garda for fun rides on the water. 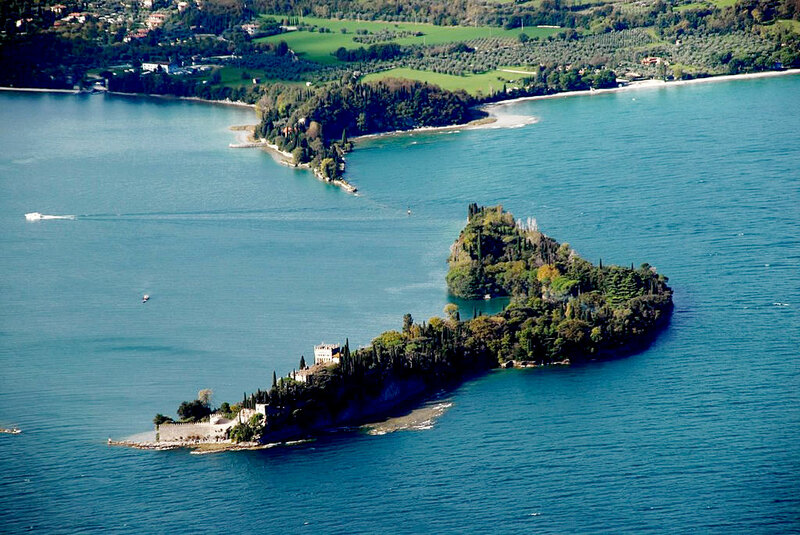 Starting from the charming harbor of Desenzano, the Capital of the lake, we suggest the navigation towards the tip of Sirmione, where you can admire the beautiful “Grotte di Catullo”: the largest and most important Roman villa in Northern Italy, as well as the crystal-clear waters surrounding it. Let's skirt the tip of the peninsula, leaving the Scaliger castle on the right, and continue in the direction of Peschiera, the walled city, where the lake becomes the Mincio river. A short stop in Lazise, with its quaint harbor and the historic Dogana Veneta (Venetian Customs House), then let's continue towards Bardolino, cross the Garda Bay and get to one of the most spectacular spots of the Lake Garda: Punta San Vigilio. This unmissable stop boasts incredible landscapes, besides the beautiful mermaids' bay to take a dip in, and the small port with a tavern where you can enjoy delicious snacks. Now let's head back north towards Torri del Benaco, another quaint village, and then cross the lake to the Brescia shores, where we can make a stop in the charming Toscolano- Maderno. Later on, let's go down to Gardone Riviera and its famous Vittoriale degli Italiani (“The Shrine of Italian Victories”), home of the important writer Gabriele D' Annunzio. We continue cruising in the Gulf of Salò up to its large and convenient harbor, for a visit to the city that played a significant role for Italy during the Second World War. Now let's sail to the beautiful Garda Island, also known as Isola Borghese: the residence of the Borghese-Cavazza family. A wonderful palace lies on this island, surrounded by a rich and particular flora. To the south, a stretch of rocks and shallow water, where stands the islet of San Biagio, better known as Isola dei Conigli (Rabbit Island), just under the imposing Rocca di Manerba (Rock of Manerba). the Scaliger Castle of Sirmione is a fortress dating back to the Scala family period, and it's the only point of access to the historic center of Sirmione. It is one of the most complete and best preserved castles in Italy, as well as a rare example of a lake fortress. 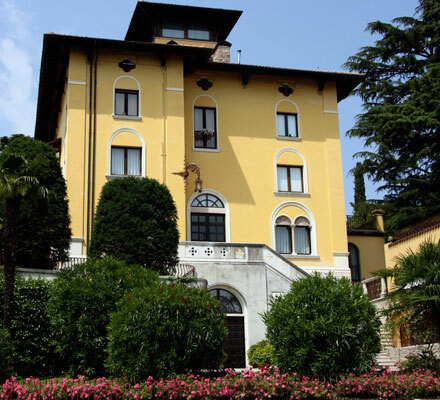 It has a very important detail: it overlooks Lake Garda, and it incorporates a dock. The castle is surrounded by the lake, and a dock was built shortly after the construction of the castle itself, to harbor the Scaliger fleet. The walls and the three massive towers are characterized by swallow-tailed crenellations, typical of the Scaliger buildings: right behind, the imposing 47-meter high tower, under which were located the cells for the prisoners. The construction of this fortress began in the mid-thirteenth century, probably on the remains of a Roman fort. Its construction was ordered by the Podesta of Verona, Leonardino della Scala as known as Mastino I della Scala. The castle had a function of defense and of control of the harbor, for the town of Sirmione, being close to the border, was more exposed to aggressions. About one century later, two courtyards and an independent fortification were added and connected to the main building through a barbican, to upgrade the defenses of the fortress. In 1405, Sirmione passed under the control of the Venetian Republic, and its defensive structures got furthermore strengthened. During this time the dock was built, although probably there was already a wooden one. 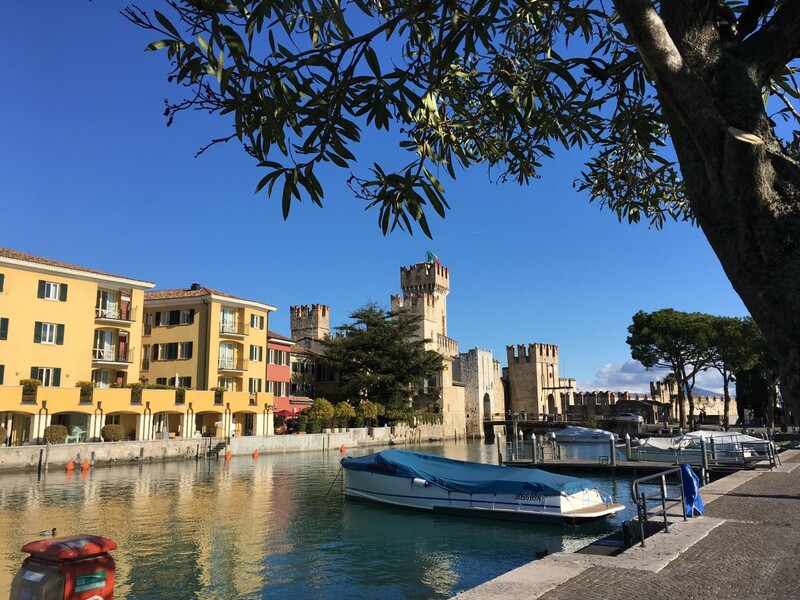 Sirmione held the record for the best defensive position until the sixteenth century, when, for political reasons, the fortress of Peschiera del Garda got modernized. say that long ago, in the castle lived a young man named Ebengardo with his sweetheart, Arice: the two lovers spent a peaceful life, until their idyll was cut short by a tragic event. During a stormy night, a Venetian knight from the region of Feltre called Elalberto asked for shelter in the castle. The couple hosted the knight who, stunned by the beauty of the girl, tried to enter her room during the night. Arice started to scream, and Elalberto stabbed her. Ebengardo ran into the room to find Arice lifeless, and blinded by rage killed Elalberto with his dagger. The legend says that even today, on stormy nights, you can see the soul of Ebengardo wander around the castle in search of Arice. the Grotte di Catullo are the remains of a Roman villa built between the end of the first century B.C. and the first century A.D. in Sirmione, on the southern shore of the Lake Garda. The archaeological complex, studied since the beginning of the nineteenth century and brought to light in several stages, is today the most important evidence of the Roman period in the territory of Sirmione, and the most magnificent example of a Roman villa in Northern Italy. Time and reasons of the decline of the villa are still unknown, but the discovery of graves, both inside and outside the building, dating from the fourth to the fifth century proves that, at that time, the structure had already been abandoned. Over the centuries, various chroniclers and travelers visited the ruins, but the first real studies on them were carried out only in 1801 by a general of Napoleon Bonaparte. At a later stage, Girolamo Orti Manara from Verona starts further excavations, making new and more extensive researches. The outcome was released in 1856 along with a plan of the site: nowadays, this text by Manara is still crucial. In 1939, the Superintendence for Archaeological Heritage launches an extensive program of excavation and restoration, acquiring in 1948 the entire area to allow an adequate protection of the complex in its natural environment. this villa is named after Maria Callas, the great soprano of Greek origins, who came here during the few pauses of his intense artistic activity. 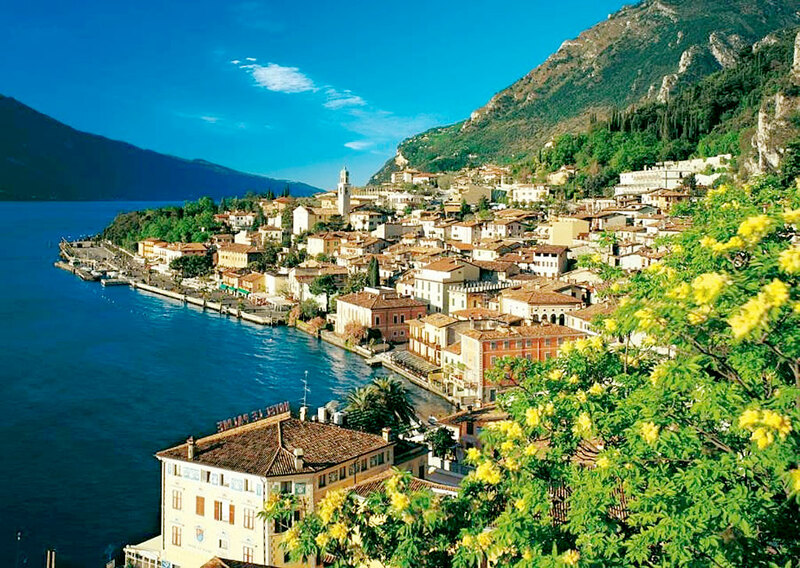 two hours to spare, you may want to visit the beautiful Garda Island, located in the central part of the lake. 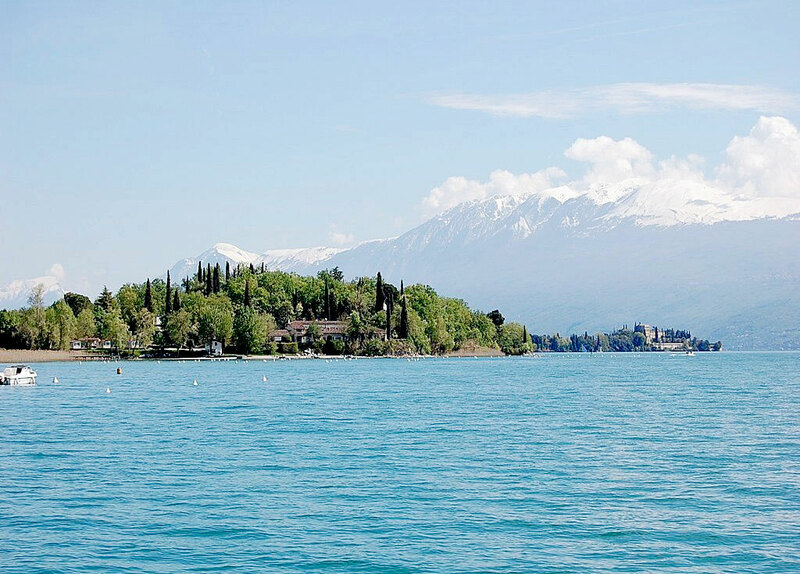 Isola del Garda is a place of rare beauty. A treasure chest, full of history, memories and legends. A pearl surrounded by the clear waters of the lake. A picturesque rock that welcomed ancient peoples, from the Romans to the Lombards. It was then home to St. Francis, St. Anthony of Padua, St. Bernardine of Siena and probably Dante Alighieri. Facing south, the beautiful and elegant building of the early '900 in the Venetian – neo-Gothic style. This is an imposing yet harmonious building, full of surprising architectural details. At his feet, terraces and Italian gardens slope down to the lake. All around, the vegetation of both local and exotic plants is lush and intact. Rare species and unique flowers bloom in this special place, alongside a harmonious wood of pines and cypresses, acacias and lemon trees, magnolias and agaves. 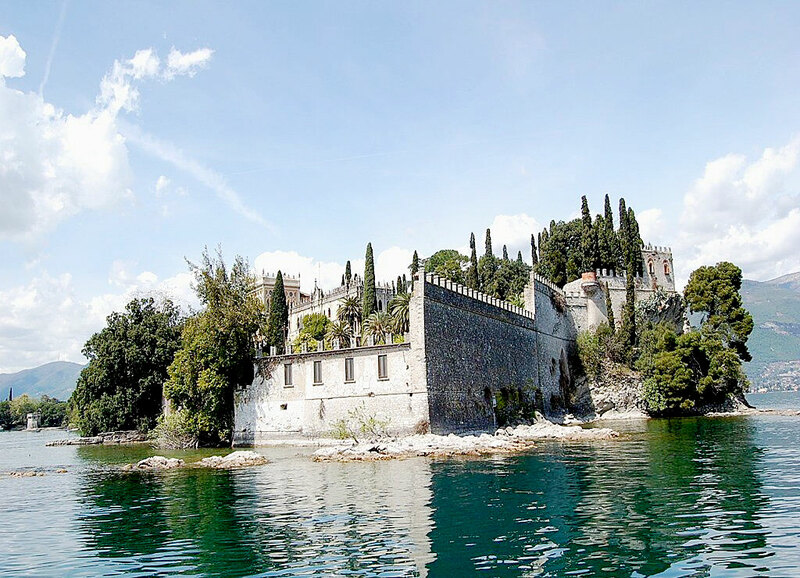 Isola del Garda is magic and mystery. The birdsong seems to be the joyous voice of the soul of those who, over the centuries, have respected, cared for and loved it. In ancient times, it was called "Insula Cranie". 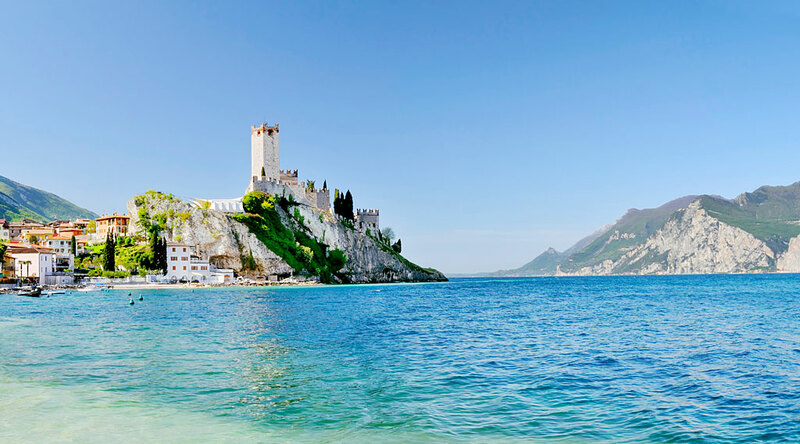 After 1000 A.D., the name was changed to "Isola del Garda", "Island of the Monks", "Lechi Island", "Scotti Island", "De Ferrari Island", "Borghese Cavazza Island". Already inhabited in Roman times, it was used as a hunting reserve until 879 A.D.. Then, its new owner Duke Carloman of Bavaria donated it to the monks. In 1221, St. Francis of Assisi established a simple hermitage in the north, on the rocks. The five monks of that settlement lived a life of contemplation, in absolute poverty, in their cells dug into the rock. In 1227, St. Anthony of Padua visited the site. Probably even Dante Alighieri landed on the island, in 1304. From 1383 to 1444, St. Bernardine of Siena adorned the garden of the convent (with lemon, lime, orange and olive trees). Subsequently, Francesco Licheto (a Franciscan) held public lectures on philosophy and theology. At his death in 1529, began the decline of the hermitage. In 1803 (Napoleon had founded the Cisalpine Republic six years before), the religious order was suppressed. 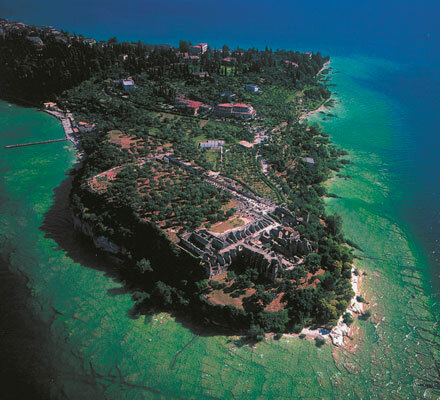 The island became the property of the State, and then was sold to the Conter family of Salò. In 1817, the property passed to the Benedetti brothers (from Portese), to Giovanni Fiorentini (a merchant from Milan) and to the Lechi family (from Brescia). In 1860, the area was expropriated and used as a military outpost. At the beginning of 1870, the Scotti family won an auction on the site and then sold the island to the Duke de Ferrari (from Genoa). He decided to build the monumental building which still stands today. The works were supervised by an architect from Genoa named Rovelli and completed in 1903. The result was an impressive building, really complex, in a neo-Gothic Venetian style (which reminds of the Doge's Palace in Venice). At the death of Mary Annenkov (wife of the Duke de Ferrari), her daughter Anna Maria inherited the building. She enriched the garden with flowers and exotic plants. Anna Maria married Prince Scipione Borghese and their daughter Livia took great care of this paradise for over fifty years. She was the wife of Count Alessandro Cavazza and had three children: Novello, Paolo Emilio and Camillo. The latter inherited the island, and the current owners are his wife Charlotte Chetwynd Talbot, and children: Sigmar, Livia, Eric, Ilona, Alberta, Christian and Lars Patrick. The Vittoriale degli Italiani (“Shrine of Italian Victories”) is the monumental citadel built in Gardone Riviera, on the shores of the Lake Garda, by poet Gabriele D'Annunzio and architect Giancarlo Maroni from 1921 to 1938. It is a complex of buildings, streets, squares, theaters, gardens and waterways. It was erected in memory of the "inimitable life" and of the accomplishments of the Italian troops during the First World War. The inscription at the entrance calls it a "book of living stones". The Foundation of the Vittoriale degli Italiani is open to the public year-round, and visited by about 180,000 people a year. 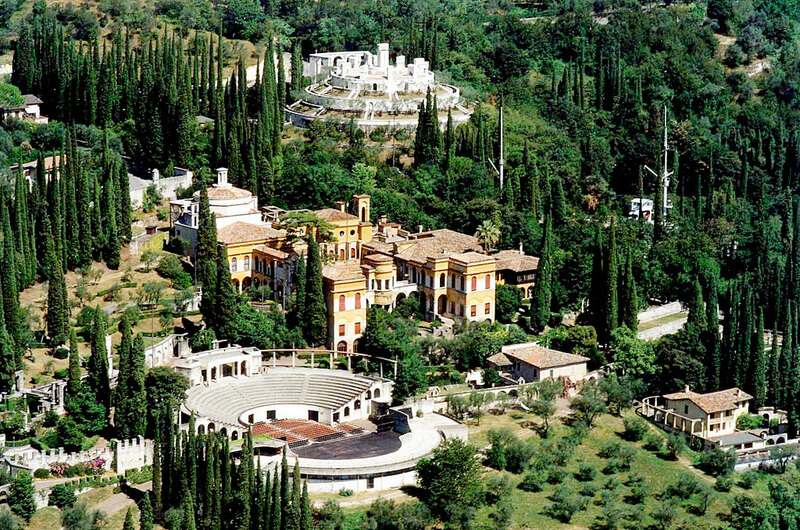 The gardens of the Vittoriale are very large, covering about half the area of the complex. At the monumental entrance start two paths: the “esoteric” one takes you through the different squares to the house of D'Annunzio and to the mausoleum of Heroes, with the tomb of the poet; the "profane" one, instead, leads to the lake, the groves and the valleys of “Acqua Pazza” and “Acqua Savia”. In the second part of the garden lies the violin-shaped "giardino delle danze" (garden of the dances), with two artificial streams called "Acqua Pazza", a rugged one, and the quieter "Acqua Savia". 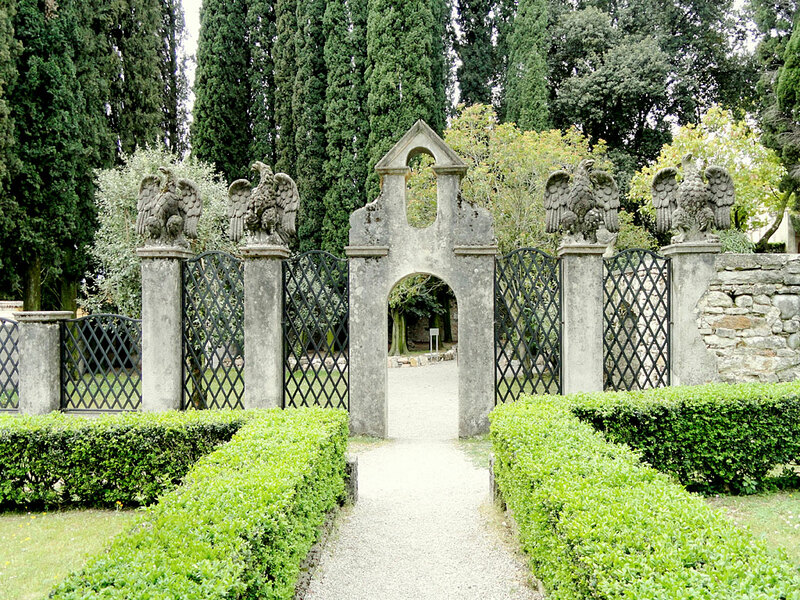 The D' Annunzio villa, formerly Villa Thode and then renamed "Prioria", consists of twenty rooms adorned with engraved mottoes and diverse objects positioned to inspire suggestions, thanks to a vague monastic atmosphere. It holds a rich library of 33,000 books of Italian and French literature, history, art and rare editions including 16th-century books and incunabula. In the lake there are five islands, all quite small. 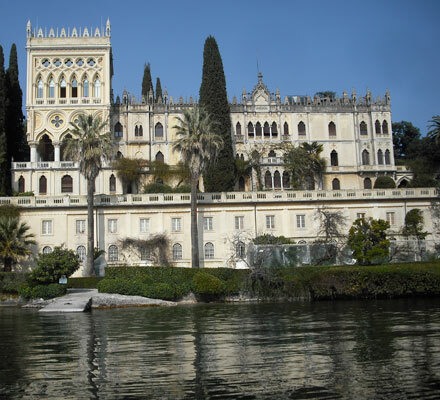 The largest is the Isola del Garda, where in 1220 St. Francis of Assisi founded a monastery for the monks of his order, a structure closed only in the eighteenth century and replaced in the nineteenth by a building in Venetian neo-Gothic style. Not far lies the second largest island, the San Biagio island, also called "of the Rabbits" because of its large population of hares and rabbits in the sixteenth century. The island, located in the south- eastern part of the Gulf of San Felice, is close to the coast and in dry periods it is reachable on foot. Along the eastern shore there are three other islands, all of small size and located near Malcesine: the northernmost is the isola degli Olivi, then there is the isola del Sogno, also reachable on foot in dry periods, and finally, the southernmost isola del Trimelone (or Tremellone). Malcesine lies 60 kilometers to the north-west of Verona. 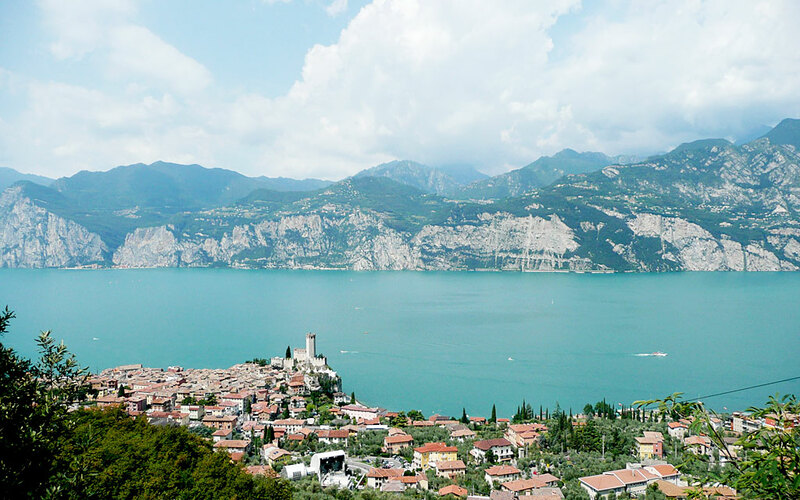 It is the northernmost municipality of the Verona province, on the coast of Lake Garda. Its boundaries go from the shores of the lake to the summit of Monte Baldo. In the nearby village of Cassone flows one of the shortest rivers in the world: the river Aril, about 175 meters long. 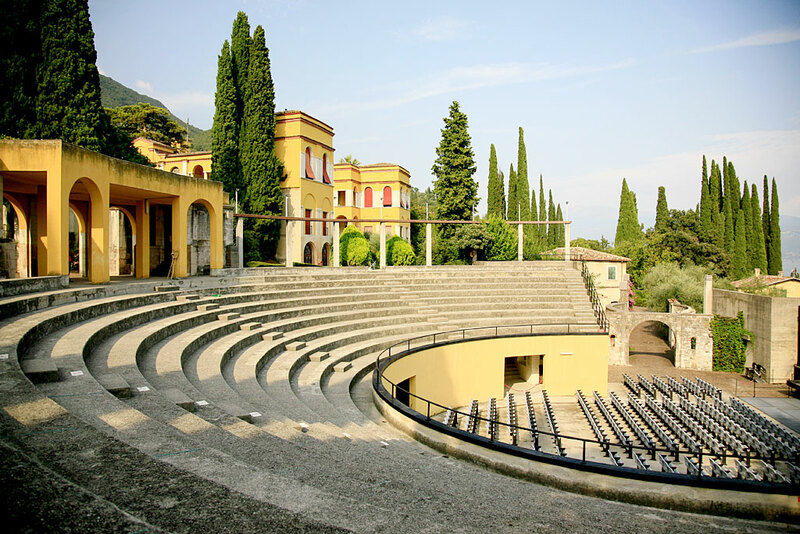 During the summer, there is a lively cultural scene with several concerts at the Lacaor Theater, a striking natural arena at the foot of the Scaliger Castle, and exhibitions of painting and sculpture. International competition for children choirs: a very important children choirs competition is organized every other year on a national and international level by the “Garda in coro” association, with the best Italian and foreign groups and the relative choral music composition contest. Subscribe now and keep updated on the latest News and Offers.